Profession: Economist, Professor of Economics, Chittagong University, Bangladesh, From 1969 to 1972, Muhammad Yunus was an economics professor at Middle Tennessee State University in Nashville, Tennessee, USA. Award: Professor Muhammad Yunus Nobel Peace Prize 2006 Winner and received other more than 60 national and international awards. Politics: In 2007 Professor Muhammad Yunus interested in a political part in Bangladesh and named “Nagorik Shakti” but later discarded. Top position : Professor Muhammad Yunus selected “25 most influential business people in the last 25 years” by Wharton School of Business PBS documentary in 2006 and included World’s top 100 “60 Years of Asian Heroes” by Times Magazine in 2008. Education: Peace Prize Winner Muhammad Yunus passed the Entrance Examination from Chittagong Collegiate School securing the 16th Position among the 39,000 students in East Pakistan. He was an active Boy Scout and traveled west Pakistan and India in 1952, and in 1955 to participate in Canada Jamborees. 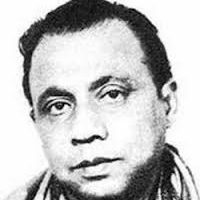 Muhammad Yunus was a student of the University of Chittagong, he became active in cultural activities and won awards for the action film. 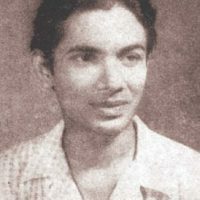 Muhammad Yunus enrolled at the Faculty of Economics of Dhaka University in 1957 and received his Bachelor of Arts (BA) in 1960 and Master of Arts (MA) in 1961. In 1965, Muhammad Yunus was offered a Fulbright scholarship to study in the United States. Yunus completed Ph.D. in economics from Vanderbilt University in the United States by the State graduate program in development (GPED) in 1971. 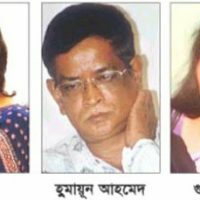 Liberation war: In 1971, during the liberation war of Bangladesh, Muhammad Yunus founded a citizen’s committee and ran the Bangladesh Information Center, Bangladesh with life in the United States to obtain support for the liberation. Grameen Bank: Professor Muhammad Yunus started process of Grameen Bank in 1976 at University of Chittagong as he launched a research project to know how to design a credit delivery system to provide banking services to the rural poor of Bangladesh. As he got positive result, in October 1983 the Grameen Bank was authorized by national legislation as an independent bank. co-guarantors of repayment and support each other efforts at economic self-advancement. As it has grown, the Bank has also developed different systems of credit that helpful for the poor. In addition to microcredit, grameen bank offers education & housing loans as well as loan for fisheries and irrigation projects, venture capital, textiles, and other small capital investment activities, along with other banking services such as savings. Professor Muhammad Yunus and Grameen Bank were chosen for the prestigious award from among 191 candidates, including 168 individuals and 23 organisations. Dr. Muhammad Yunus, dubbed “Banker to the Poor”, began fighting against poverty during a famine in the year 1974 in Bangladesh with a loan of $27 out of his pocket to help 42 women buy weaving tools to save them from the clutches of the moneylenders. “The Poor people got the weaving tools quickly, they started to weave quickly and they repaid him quickly,” said Mjos. “Muhammad Yunus and Grameen Bank have shown that even the poorest of the poor can work to bring about their own development,” the Nobel Committee said in its citation. 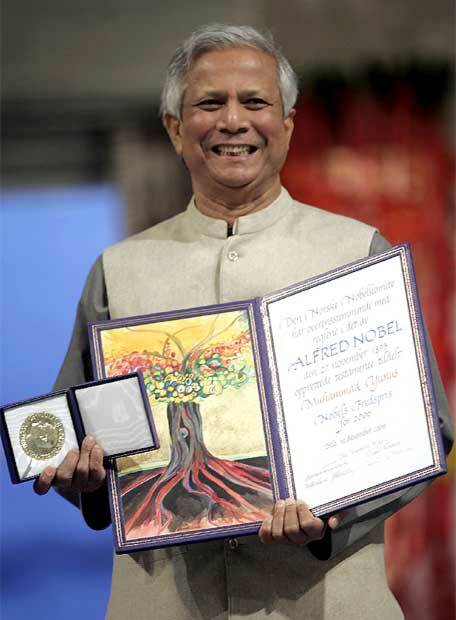 Recipient of numerous national and international awards, Professor Muhammad Yunus termed the Nobel achievement “the sky”, but said it also “burdened us with further responsibility. Bangladesh now must remove poverty from the country and also put in more efforts to eradicate poverty from the world.”practice. “This is an honour for the country, for the nation…This kind of incident does not happen often to a nation,” Nobel Peace Prize Winner Professor Muhammad Yunus said, thanking the Almighty. “We [Bangladeshis] have taken many things from the world, now we (Bangladesh people) have given something to the world. We have placed a model before the world,” Muhammad Yunus added. “Now I dream of Bangladesh as the first country to be freed from hunger,” Professor Muhammad Yunus said. Asked if the prize is appropriate for peace, Nobel Peace Prize Winner Dr Muhammad Yunus said, “I was not astonished to get the Nobel Prize for peace because economics and peace are interrelated-economics influences people’s life. “Hunger is one of the main reasons of anarchy. If it is prossible to reduce poverty from the society, peace will come on earth,” Nobel Peace Prize Winner Muhammad Yunus added. Nobel Peace Prize Winner Dr Muhammad Yunus said, “I will not spend the prize money for myself… I will rather spend it in social business on a no-profit no-loss policy. Grameen Bank will also establish an eye hospital where even beggars will be given treatment at the cost of Tk 10- Tk. 20. “We will make yogurt with all kinds of nutritious elements. 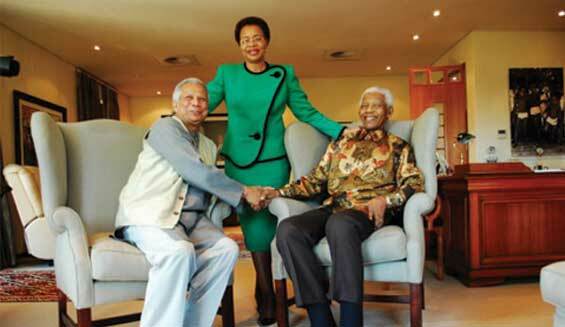 We want to provide nutrition to the poor and children,” Professor Muhammad Yunus said figuratively. In the field of development idea, Nobel Peace Prize for Professor Muhammad Yunus was long overdue and it is in recognition that the country has something to offer to the world, top economists, researchers and business leaders observed. 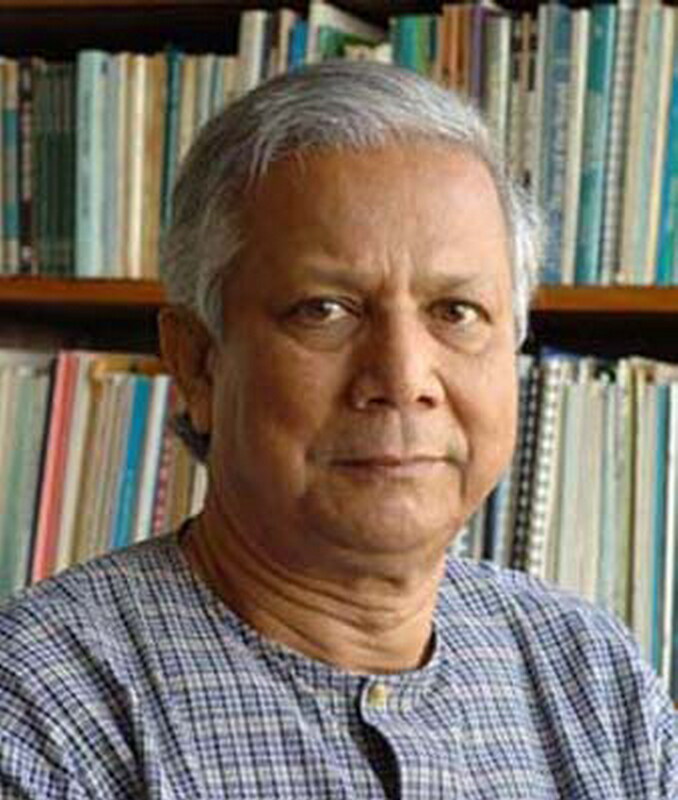 Muhammad Yunus, the visionary and developer of the unique microcredit concept, was born at a poor village in Chittagong in June 28, 1940. The Grameen Bank, which Muhammad Yunus founded and shared the Nobel Peace Prize 2006 with, now has 2211 branches covering more than 70370 villages and 6.5 million people. 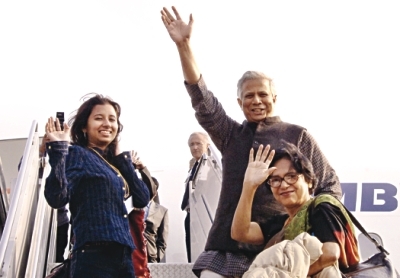 Nobel Peace Prize Winner Professor Muhammad Yunus is now living a happy life in Bangladesh with his wife Mrs Afrozi and daughter Deena. 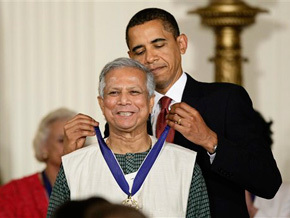 Nobel Peace Prize Winner Dr. Muhammad Yunus has received his Phd in Economics from Vanderbilt University in 1969 after getting Fulbright scholarship. Muhammad Yunus did some teaching in Colorado University too. 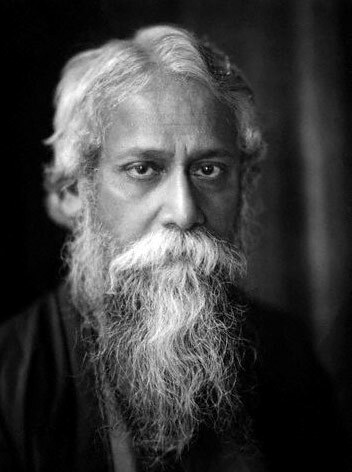 After the end of his seven-year stay in US, He supported the Bangladesh’s freedom struggle. 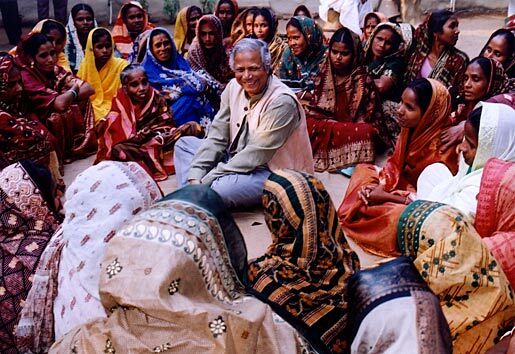 Returning to Bangladesh and observing the poverty of rural people in the clutches of exploitative moneylenders, Muhammad Yunus came up with the idea of microcredit. Professor Muhammad Yunus first involved himself in fighting poverty during the 1974 famine in Bangladesh. Muhammad Yunus discovered that very small loans could make a significant difference to a poor person’s ability to survive with a family. The first loan Muhammad Yunus gave was of $27 from his own earning. He lent it to about 42 female basket weavers in the village of Jobra near Chittagong University. Dr. Muhammad Yunus discovered that they could repay the amount very quickly by selling their goods in the market. Before this, they used to take loans from village loan-sharks with high interest rates. In some cases, the interest rates stood at a staggering 10 per cent a week. As a strong financial stitution banks were not interested in giving tiny loans to poor people and they considered the poor to be bad borrowers. 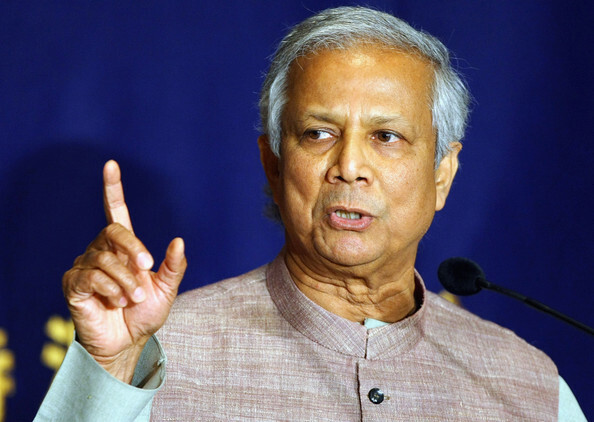 In 1976, Muhammad Yunus launched the activities of Grameen Bank and started giving loans to poor Bangladeshis against the advice of banks and the government. He carried on giving out micro-loans and in 1983, he officially formed the Grameen Bank, meaning Village Bank, on the principles of trust and solidarity. The Grameen Bank’s method of giving out loans is now used in projects in 58 countries, including the US, Canada, France, the Netherlands and Norway. In 1997, Nobel Peace Prize Winner Dr. Muhammad Yunus led the world’s first microcredit summit in Washington, DC. Dr Muhammad Yunus received over 60 different national and international awards before winning the Nobel Peace Prize in 2006.